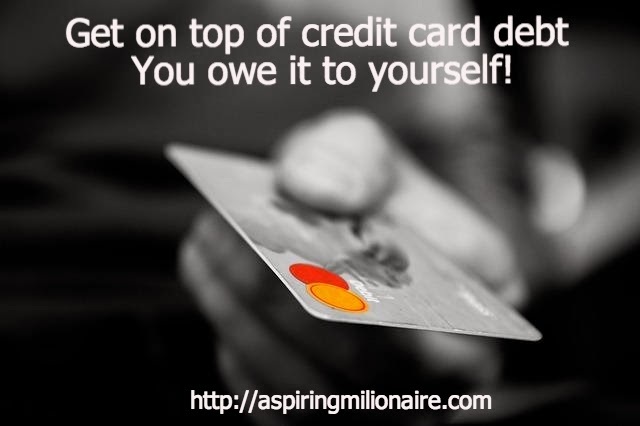 Aspiring millionaire: Get on top of credit card debt - You owe it to yourself! Get on top of credit card debt - You owe it to yourself! We Australians are renowned for doing things on a larger scale. Unfortunately, when it comes to owing money we make no exceptions and are currently the proud owners of one the highest average household debts in the world. A report from the Melbourne Institute showed that in 2012, the mean average debt level for Australian households was $151,488. More recently the Financial Review published figures that show Australian household debt has hit a record 177 per cent of annual disposable income. Though these figures include money owed on mortgages, which makes up a large proportion of Australia’s personal arrears, the other main protagonist in the debt story is our old friend, the credit card. In fact, last year the money we owed on store and credit cards topped $50 billion dollars for the first time. Just like any debt, it’s fine when we can keep up with repayments. But outstanding credit card balances can be hard to stay on top of if circumstances change unexpectedly. Life has a habit of throwing curveballs when we least expect them, and losing income or being hit with an unexpected expense like a repair bill can put you back at square one when it comes to keeping on top. That’s why we thought we’d share a few ways to make sure a worry-free financial future is on the cards when it comes to that pesky plastic. In short, this means you should always pay more than the minimum payment and switch to a lower rate. Of course, when it comes to interest nothing is quite as good as nothing. With lots of credit card companies offering tempting zero per cent deals for six months or more, go for a transfer and all your payment will be going towards clearing your balance and not just fighting the ever-increasing interest. Too good to be true? Well, not if you fully understand the terms and conditions. We all know credit card companies aren’t in it out of the goodness of their hearts, so ask the question if they are going to charge you any interest to transfer and if there are any other costs. Do your figures and make sure the transfer still works out in your favour. Also, be aware that the zero per cent offer will normally only be for the balance you transfer, not any purchases you make on the new card. So try and avoid using your new plastic and concentrate on paying off the debt. Sounds like a no-brainer, but the simplest way to avoid increasing your credit balances is by using your debit card instead. This means what you spend comes straight from your bank account and you can’t use more money than you have available. Go cash only and you’ll find that your credit card debts start to head in the downward direction a lot faster. If you’re ready to make it curtains for your credit card debt, it’s time to make it scissors for your credit cards. Getting the balance right with your figures is crucial to taking control of your credit card debts; try and pay more than you are at the moment each month and you’ll see results a lot quicker. If you’re already up to the maximum payment you can afford, there are two ways of doing this: spend a little less or earn a little more. You can try and achieve the former by working out your monthly outgoings and seeing if you can reduce things like travel expenses or eating out and nights on the town. Or, don’t change a thing and go for the latter approach; try and negotiate extra hours at work or finally get the boss to agree to that pay rise. If you have multiple credit card debts, consolidating into a personal loan is another option to help you clear the money you owe whilst staying in control. Firstly, the interest rate you’ll pay is normally a lot lower that that charged by credit cards so you’ll end up paying off less money in total. If you have multiple credit card debts, consolidating into a personal loan is another option to help you clear the money you owe whilst staying in control. Firstly, the interest rate you’ll pay is normally a lot lower that that charged by credit cards so you’ll end up paying off less money in total. Secondly, by putting all the debt you owe on credit cards, personal loans and any other debt in one place with one simple monthly payment covering everything. Finally, a loan will give you the peace of mind that you’re paying off the full amount, not just the interest. Rachel Maher is a financial content writer from Western Australia. Setting and revising a budget are always the first step in whittling away debt. The next, is tacking those debt payments. I prefer 0% balance transfers, but this can only be achieved by first going through step one - budgeting!